Thoughts never leave emotions and emotions never thought isolate. This is a fact that neuroscientists have beenshown through various studies. In the last ten years what we know as the neurosciences, have advanced hand in hand with technology, providing answers about the functioning of the nervous system and behavior emanating from him. Neuroscience as it is known today, is the result of convergence of several scientific traditions: Anatomy, Embryology , Physiology, Biochemistry, Pharmacology, Psychology and Neuroscience. Other scientific disciplines such as Computer Science or Bioengineering have recently joined this multidisciplinary group of science. Noninvasive techniques using neuroscience as functional magnetic resonance imaging and electroencephalography, have shown that 95 % of buying decisions are held in the subconscious part of the brain. For this reason, science has an important role to discover the intimate parts and subconscious elements that determine how consumers react , remember, keep , learn, and use information from their environment. Daniel Kahneman who won the Nobel Prize in 2002 for integrating advances in psychological research into economic science, analyzed the complexity of the reasoning of the people at the time of making economic decisions and demonstrated his studies focused particularly on the stock values​​, that decision affects more buyers, the prospect of losses that a similar proportion of earnings prospects. He stated that, when we choose, we do not always objectively. This lack of objectivity tends to follow regular patterns that allow a mathematical description. According to Kahneman, individuals underestimate the likely results are compared only with the results that are obtained with ease. 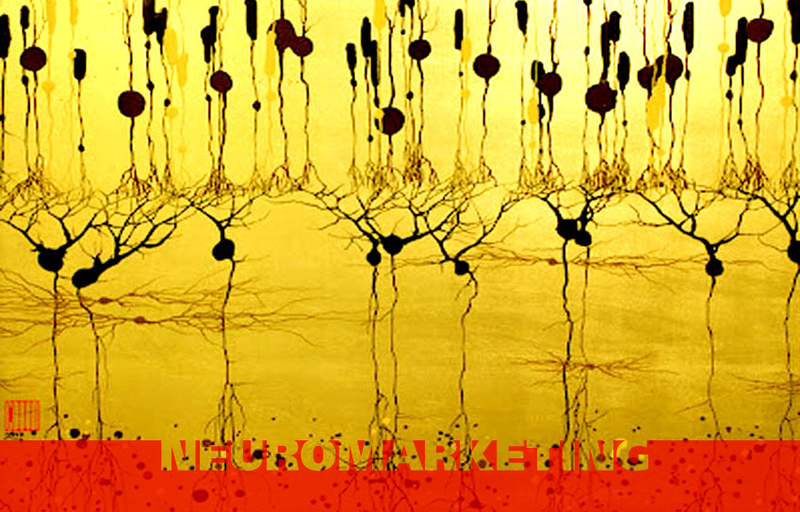 Same as art or science looking rediscover and provide new questions and answers about the world and its beauty, marketing, in the light of new discoveries that brings the study of the nervous system, are trying to better understand the operation of its universe: client. We now know that more than a ” uni” verse is a “multi” verse, where the brand is built from multisensoriality , bringing a deeper and more complete sense. An example is the use of all the senses in building the brand experience, the El Bulli restaurant, rated three stars by the Michelin Guide (9.75 out of 10 ) The attitude and intention of these culinary artisans, was based on the provocation of the senses, since obviously the taste through the less obvious such as touch or hearing through, for example, the crisp sound of some of their creations. [ evidence ] The illustration accompanying this post belongs to Greg Dunn, PhD in Neuroscience from the University of Pennsyvania and lover of Japanese art, especially from the Edo period. His works are influenced by ancient Japanese masters, painting with ink and gold prints, only instead of representing the beauty of trees, flowers and animals, he decided to express the beauty of these mysterious cells called: neurons. This section provides news and information about the company and branding's issues.